“Three dead Americans lie on the beach at Buna”. Due to the number of dead bodies on the beach, the Allies nicknamed it “Maggot Beach”. At a time when censors used a heavy hand to keep the American public from knowing and seeing the carnage in the Pacific during World War II, this ground-breaking photograph of dead American soldiers confronted the American public for the first time with the real face of the war. It showed the bodies of three American soldiers who had been killed on Buna Beach in New Guinea. 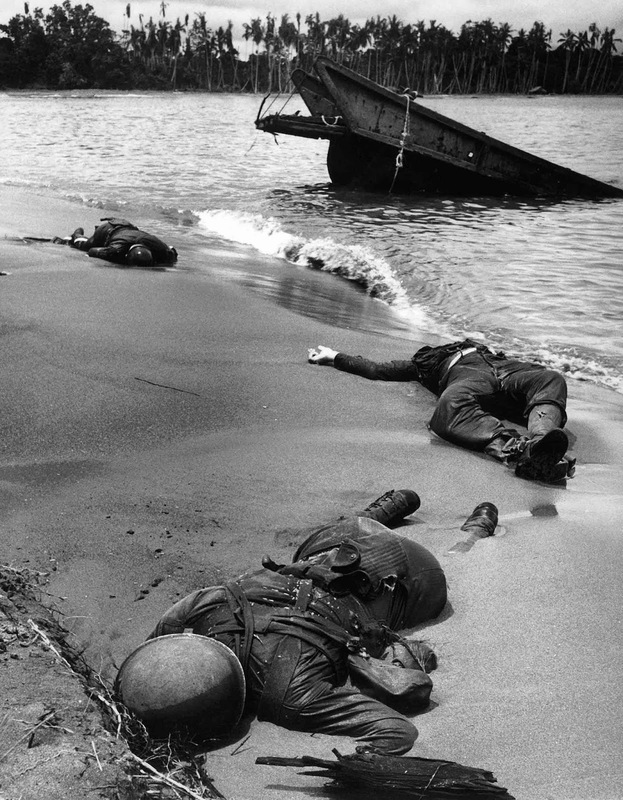 Though none of the men were recognizable, the photo was arresting in its stark depiction of the stillness of the death, and then shocking when it became clear on second glance that maggots had claimed the body of one of the soldiers faced down on the sand. The photo was taken by LIFE’s photojournalist George Strock. Images that Strock took of dead American GIs were not published because the U.S Office of Censorship prohibited their publication, as they refused to allow any pictures of American soldiers killed in combat. LIFE editorialized that “we think that occasional pictures of Americans who fall in action should be printed. The job of men like Strock is to bring the war back to us, so that we who are thousands of miles removed from the dangers and the smell of death may know what is at stake”. The case went to the White House, where president Franklin D. Roosevelt finally approved its publication. President Roosevelt feared that the American public might be growing complacent about the war and its horrific toll. The photo, taken in February 1943, was finally published on LIFE’s September 20, 1943 issue. The impact of images like Strock’s was mixed. The image provoked considerable controversy. The Washington Post argued that the pictures “can help us to understand something of what has been sacrificed for the victories we have won”. Some readers attacked LIFE for exposing the public to more information about the war than they were prepared for, or for engaging in “morbid sensationalism”. The picture improved War bond sales but negatively affected enlistments. Strock’s photograph has been described as the “most famous and influential photographs ever taken in any war”. It became a classic image of war photography.